Hatters boss John Still insisted he is big enough to deal with any criticism that comes his way after the backing of Northampton Town chief Chris Wilder this week. The Cobblers manager, who is a close friend of Still, was asked about the pressure Still was under during his pre-match press conference this week ahead of today’s fixture at Kenilworth Road. Speaking to the Northampton Chronicle & Echo, Wilder said: “You talk about managers, and I know John Still really well. 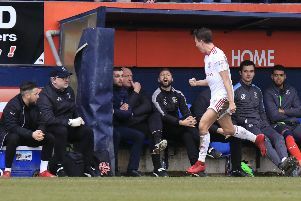 “The job that he did in getting Luton promoted was incredible, and this time last year I think they won eight or nine games on the bounce and were in the automatic promotion places. “John has done an unbelievable job there and they have some good players, but he is just trying to find the right formation and the right mix. “I think John would have expected Luton to be a little higher up the table, but Luton can go and win four or five games as they did last season, because they have the players and the manager to do that. When asked if he appreciated the backing of his fellow manager, Still said: “Chris would be supportive of me 100 per cent, even if I was hopeless and he knew I was hopeless, he’d be supportive of me because he’s my pal. “I appreciate all of that, but I’m a big man, I can do it and get on with it. “I accept the highs and lows and I always say this, the only person that needs to be happy is me. “If I’m happy, I’m fine, if anyone else is unhappy, I can’t affect that, the only person I can affect is me, how I do it.